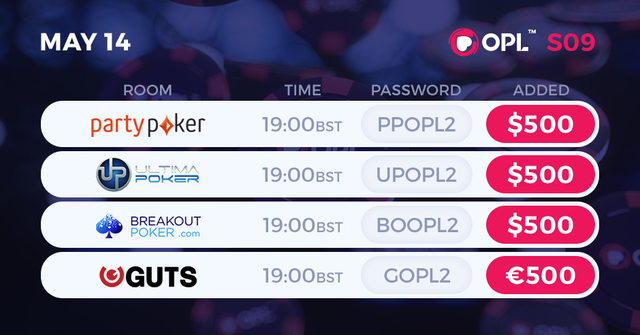 After a hugely successful Season 8 of the worlds biggest Online Poker League, it's a quick turnaround as we kick off Season 9 THIS SATURDAY 12th MAY! This season is going to be a little different as it will be a quick one! We are packing each night chock full of events and the whole league will run from the 12th - 20th May with between 3 and 5 tournaments each and every night! 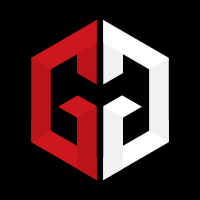 We have some new and familiar names this season, as well as the introduction of crypto currency poker sites to the league! We know that cryptocurrency poker sites are still very new, so to encourage people to get involved here they will primarily be freerolls on both Coin Poker and BetKing! 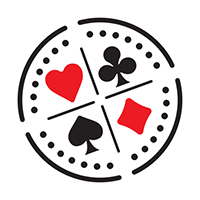 The first 2 events on Coin Poker will be freerolls with $250 added and $500 added. 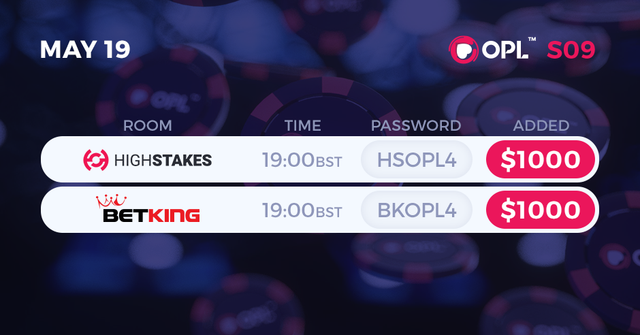 On Betking the first THREE events will be freerolls, with $250, $500, and $750 prizepools! For the full OPL Season 8 schedule Click Here, and don't forget to add your username for each room to your OPL account! As always, you will be playing for your Top 10 scores throughout the season to try and top the leaderboard, which will see 1st place awarded tournament tickets worth a huge $3000! 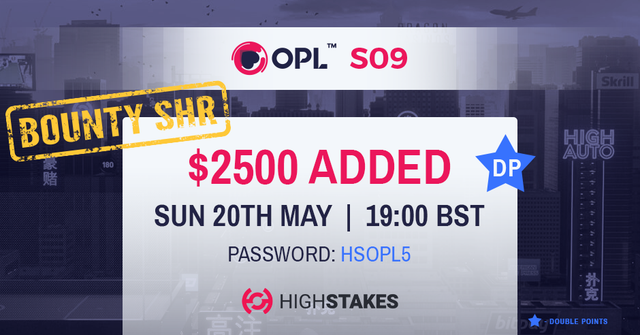 Any questions please comment, message me, email hello@pokervip.com, add me on Skype: ash.180vita or if you would like to be added to the Official OPL Whatsapp group, please send me a message with your mobile number! Congrats to all cashers and points scorers over the weekend! 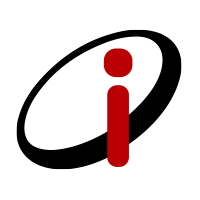 1) This event has been cancelled and will NOT count towards the leaderboard. 2) All remaining players are being paid $62.50 according to 1st place prize.. Sorry for anyone who wasted their time and didn't get the points. It is one of those things which we cannot control and happens. Moving on to tonight, we move onto the $5 buy-ins, each with $500 added! That's TWO events tonight that are double points so make sure you get involved and really make a launch on the leaderboard! We are well into Season 9 of the OPL, and we don't let up tonight as we have another THREE events for you to get stuck into! That's a possible 400 points to be won tonight! Half way through the week and we are half way through Season 9 of the OPL! We do not let up, as like every night this Season, we are jam packed full of online poker league action! and €10 buy-in on Guts with €750 Added! Then we have Ultima's final event of the season, coming with a $25 buy-in and $1000 added! Now would also be a good time to take stock of the current leaderboard standings. 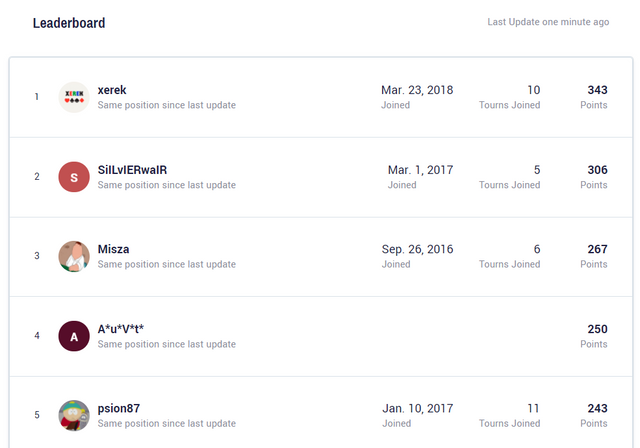 As you can see, there is no runaway leader and it's all pretty close, and with a potential 100/200 points to be won in each tournament, it is very much open for anyone to take down! Another day and another $2000 in added money to be won! 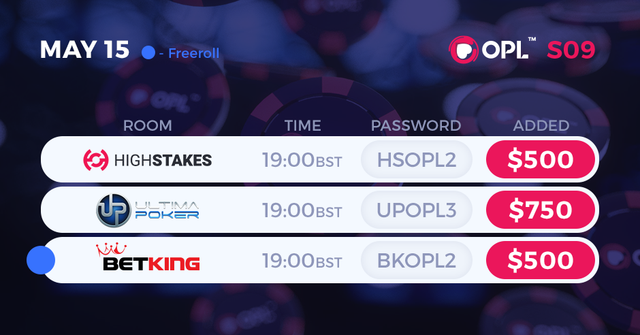 The best thing about it, is that the events on both Coin Poker and BetKing are freerolls! Highstakes is just a $10 buy-in with a nice $750 added. TOO MUCH VALUE! Talking of High Stakes, we have added a super high roller tournament to the final day of Season 9 this Sunday evening! It's a $55 buy-in with a massive $2,500 added with a TURBO structure and bounties to boot! We expect first place to be around $1,500 and a field of roughly 40 players, so get involved and end the season with a BANG! Is High Stakes not open to UK players? jongordon84: Is High Stakes not open to UK players? Now the festivities of the Royal Wedding are over, we can look ahead to tonight's penultimate events of the OPL! 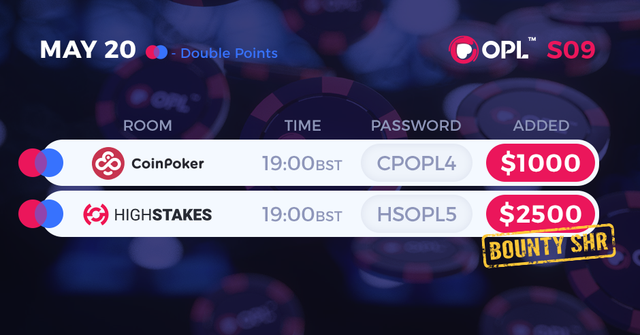 Two tonight, both at 1900BST, both $25 buy-in and both come with $1000 ADDED! 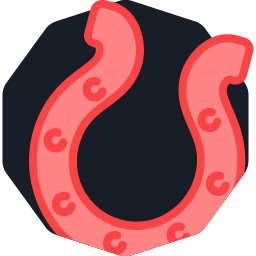 See where you are in the current Leaderboard to see where you stand and what you need to do over this final weekend! It's been a quick season and we are upon the final night! We have two tournaments to finish off Season 9, including the added 'Super High Roller' Bounty event on High Stakes! Both events also award double points, so a potential 400 points to be won which could REALLY change things at the top of the Leaderboard! 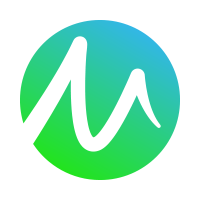 with 5 places being paid in the leaderboard with a mincash of $750, there is LOTS to play for, on top of the $3,500 in added prize money! GOOD LUCK EVERYONE FOR THIS OPL NIGHT! I was able to sign up with a UK address, and deposit with GBP, and only when I download the client and login does it tell me I cannot play. Now to get my money back I have to verify my identity. It's very annoying! Maybe stick something above sign up links saying who is eligible to play. The main issue is that dealing with a number of poker rooms, each of that have very differing restrictions and eligibilty and obviously there's a lot of countries, who also each have their own legality and restrictions! 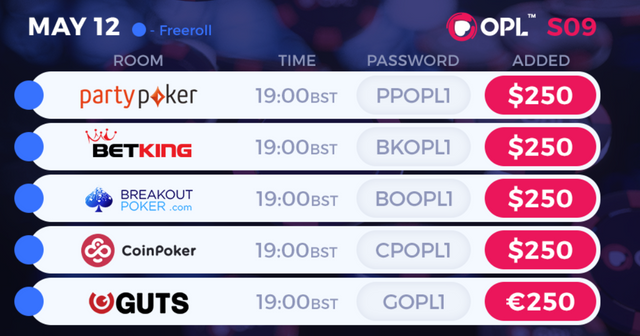 The best way is the Poker Rooms page on the OPL website, which will only show rooms which you are able to play on based on your location given via your IP address.